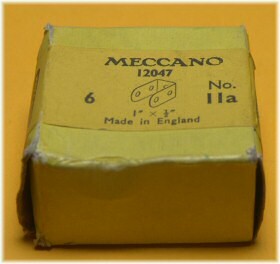 Initially this part was ¾'' wide, a most unusual Meccano part measurement. After only three years it was shrunk down to the more familiar half inch width. In the sixties a 'longer' versions with 1'' arms was introduced into the system. 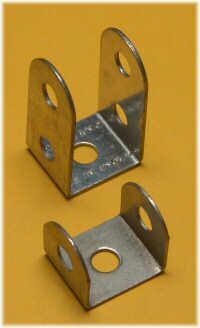 You can see from the photo to the right how the earlier 'wide' double brackets (¾'' wide) compare with the later ½'' versions of the same part. I haven't read of any good reason why this was the case, but looking at the contemporary bolts it appears to be fairly obvious. The bolts at the time were much longer, around 5/16'' (9mm) plus the head. If you put one of these in each side of the double bracket (holding one strip each), and then want to put another bolt through the central hole, you need the bracket to be exactly ¾'' wide. The picture below shows this clearly. What is surprising, though, is that the part reduced to a half-inch width in 1917, and yet the bolts remained longer until about 1921/22. Something doesn't add up here, I don't think. Or is my theory completely wrong? It might have been decided that the double bracket being half an inch wide was more important than being able to bolt them from the outside. 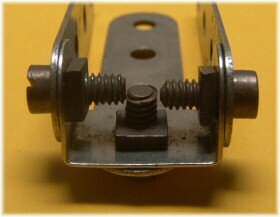 You can still fit bolts from the inside out with the smaller bracket, but it's more difficult. 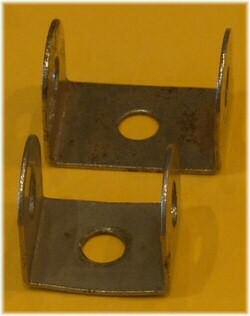 Above, a pack of double brackets, and to the right a pack of the longer double brackets. 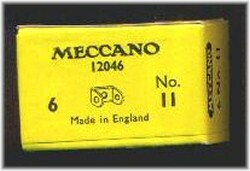 The style of these boxes dates them after 1954, but of course the long double brackets part 11a must be after 1962, the date of their introduction. Hi, I have the 11a.zn both in rounded and truncated ends.